With your reservation you receive a complimentary upgrade — your seats in the showroom will be saved! Skip the line and take your seats for the performance at your leisure. 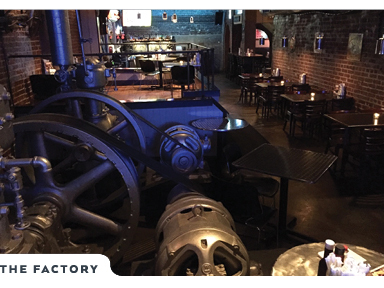 Traditional pub fare, a comprehensive bar menu, and cozy prohibition style brick-and-mortar surroundings await you in The Factory at Goodnights. Make a pre-show reservation and enjoy plentiful portions while you hang out with your friends or catch that must-win sports skirmish on one of our numerous televisions. Call 919.828.5233 to book your table immediately, or complete this form to request a reservation. For day of reservations after 4:30pm, please call our box office. Online requests are not guaranteed until a box office representative has contacted you with confirmation. For same-day reservations after 4:30pm, please call our box office. Online requests are not guaranteed until a box office representative has contacted you with confirmation.